It’s not often you get to meet a former Prime Minister, but I was fortunate enough to meet the one who, in my opinion, was the best at his job (at least during my lifetime). As most of you will know, John Howard was Prime Minister of Australia from 1996 to 2007, which coincided with my time spent in high school, university, and entry to the workforce. As such, the Australia I know and am most familiar with was forged with John Howard as Prime Minister, so it was with great interest that I went to hear him speak on the launch of his new book – The Menzies Era, which explores the reign of our longest serving Prime Minister, Robert Menzies. And it was a fascinating event. Mr Howard said that if people felt he was in power for a long time, it was nothing compared to Robert Menzies. His party took power in 1949 and were not voted out until 1972 – an astonishing 23 years. Mr Howard claimed that “such longevity would be unimaginable these days” and was likely to never be repeated in Australia. His perspective as a former Prime Minister no doubt gives him a unique insight into his forbearer, and he offered a number of statistics and factoids to support his central claim. For example, when Menzies came to power there was 49% home ownership in Australia; when he left it was 70%. The ANZUS treaty was put in place in 1961, and Menzies also signed an historic trade agreement with Japan in 1957. Interestingly, this agreement was signed just 12 years post World War Two, when tensions between the two nations were still high. But Mr Howard said, “Japan stepped in to fill the breach left by Britain, showing that the 1957 trade agreement was a very far-sighted one. The foresight of the Menzies Government to secure this agreement was the entrance to the gateway of Asia for Australia." On the future of how politicians will interact with the media, Mr Howard offered the following insight. “The landscape will continue to change. The great challenge for politicians is to continually examine different means and use them in the best way to connect with the population." Mr Howard certainly has not lost his oratory skills; his entire speech was delivered without notes and he made sure to make eye contact with everyone in the room. Indeed, you instantly recognised his skills as a political campaigner. When he entered the room he was sure to introduce himself to every attendee, and was more than happy to pose for as many ‘selfies’ as anyone would wish. 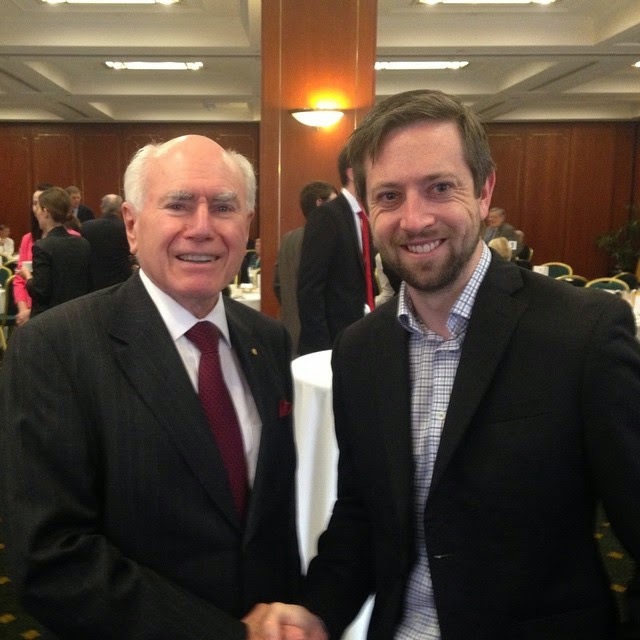 Clearly, even as a former Prime Minister, John Howard still makes it his business to try and connect with the people. And all of us in attendance were grateful for it.